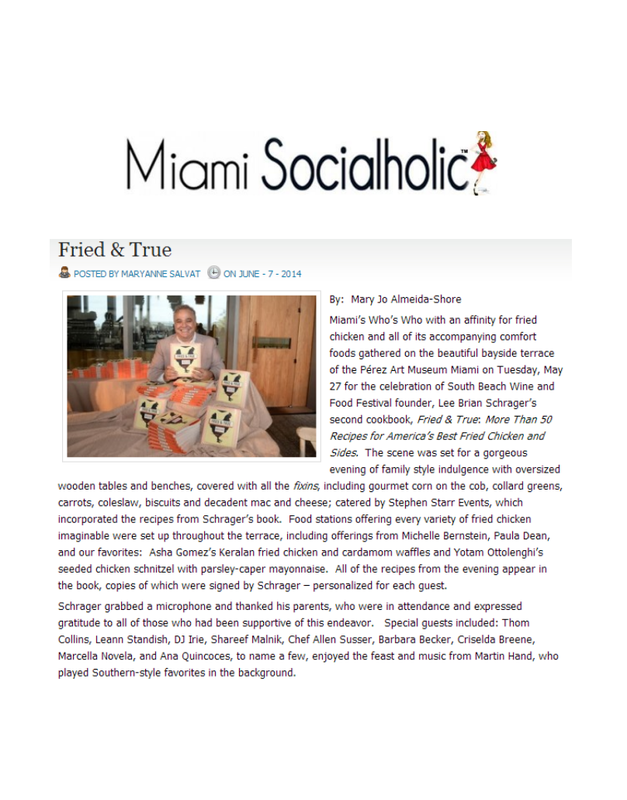 Miami’s Who’s Who with an affinity for fried chicken and all of its accompanying comfort foods gathered on the beautiful bayside terrace of the Pérez Art Museum Miami on Tuesday, May 27 for the celebration of South Beach Wine and Food Festival founder, Lee Brian Schrager’s second cookbook, Fried & True: More Than 50 Recipes for America’s Best Fried Chicken and Sides. The scene was set for a gorgeous evening of family style indulgence with oversized wooden tables and benches, covered with all the fixins, including gourmet corn on the cob, collard greens, carrots, coleslaw, biscuits and decadent mac and cheese; catered by Stephen Starr Events, which incorporated the recipes from Schrager’s book. Food stations offering every variety of fried chicken imaginable were set up throughout the terrace, including offerings from Michelle Bernstein, Paula Dean, and our favorites: Asha Gomez’s Keralan fried chicken and cardamom waffles and Yotam Ottolenghi’s seeded chicken schnitzel with parsley-caper mayonnaise. All of the recipes from the evening appear in the book, copies of which were signed by Schrager – personalized for each guest. Schrager grabbed a microphone and thanked his parents, who were in attendance and expressed gratitude to all of those who had been supportive of this endeavor. Special guests included: Thom Collins, Leann Standish, DJ Irie, Shareef Malnik, Chef Allen Susser, Barbara Becker, Criselda Breene, Marcella Novela, and Ana Quincoces, to name a few, enjoyed the feast and music from Martin Hand, who played Southern-style favorites in the background. An equally chic cocktail party in honor of Fried & True took place on Monday, June 2, as Lionheart Capital, developer of The Ritz-Carlton Residences, Miami Beach, and Yardbird Southern Table & Bar hosted a summer kick-off event at the luxury residential development’s sales gallery. Schrager, the evening’s guest of honor, signed copies of the cookbook for the more than 200 Miami socialites and celebrities at the party. Notable guests included Harry Casey of KC and the Sunshine Band, Iran Issa-Khan, Sam Robin, project developers Ophir Sternberg and Ricardo Dunin, as well as John Kunkel and Eddie Acevedo of 50 Eggs. The book features the country’s most outstanding fried chicken recipes and the chefs who make them and is available at www.FriedAndTrueBook.com. Aside from tantalizing taste buds and testing pant buttons, there’s an altruistic value to Fried & True. As with the proceeds from the South Beach Wine and Food Festival and the New York Wine and Food Festival, all profits from the cookbook are donated to charity. The South Beach event donates to Florida International University and the New York Festival gives its earnings to the Food Bank for New York City and Share Our Strength’s No Kid Hungry Campaign.